I started Surfing when I was 9/10, so I have been surfing for around 10 years. There are a lot of nice spots around the world but my favourite is Big Bay in Cape Town, South Africa. It’s Heiko style haha! I think because I grew up surfing river waves I have an aggressive style, this style gives me a unique approach to my surfing. The day when I started surfing was definitely one of the best moments. Normally I try to surf every day but sometimes there are no waves so then I do workouts, or I pick up my SUP or I go and skate. I tried to do yoga once but felt it was too boring for me. When I exercise I need to concentrate so that I don’t fall asleep. All surf trips that you do should be something which you never forget. My best ever trip was the time when I travelled with my mother through South Africa. Splinters – a film about the evolution of indigenous surfing Papua New Guinea. Haha, I think I have had a lot of bad drop ins! That was at my secret spot in Ericeira, Portugal. I rode a sweet shallow reef barrel! 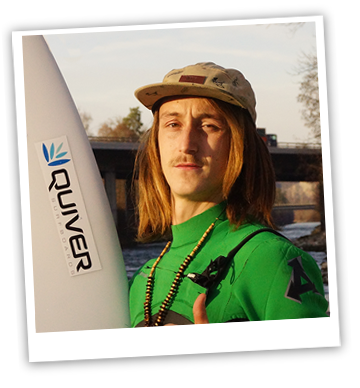 The boards that I ride are mostly 5’7″ boards in the river but can be up to 6’10”. I am also riding my new Quiver W.O.C. I think that it is better to go too big rather than too small when choosing a board.